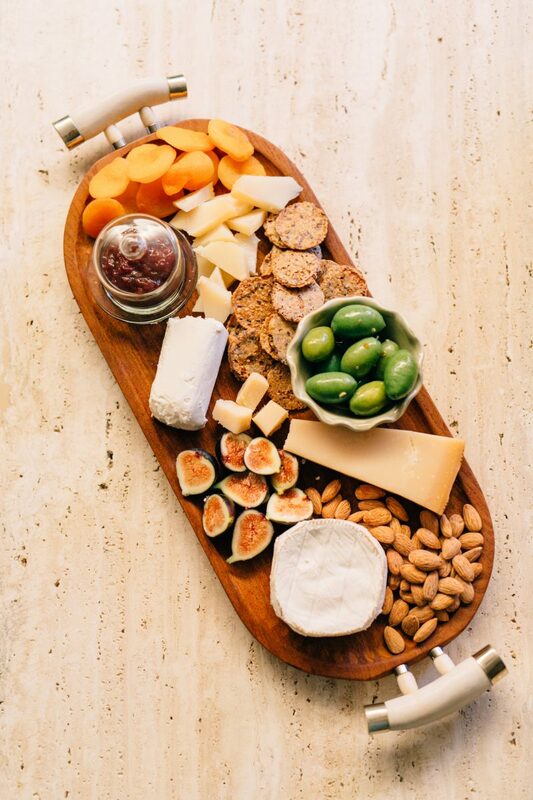 You can call me cheesy… because…I always appreciate a good cheese platter. Believe it or not, I have always been intimidated by the idea of creating a cheese board, as I never knew which cheeses to use, how to artfully cut and display them, and what other goodies to compliment it with. 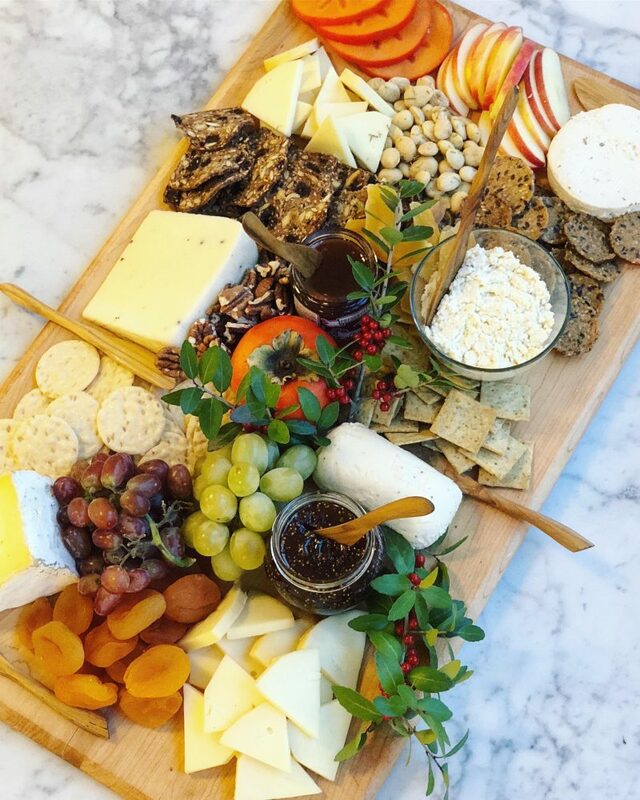 Cheese platters are a great go to when entertaining, easy to assemble and can be works of art. 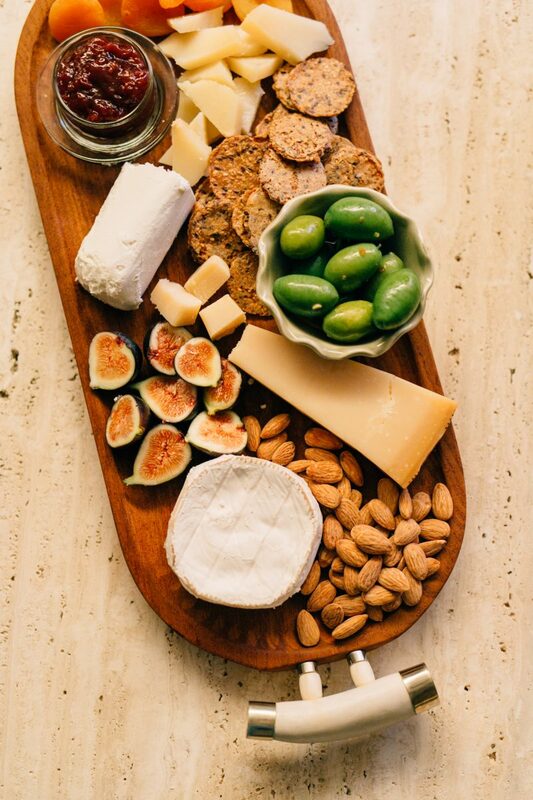 When inviting people over for drinks, and don’t have the time or the desire to whip up appetizers, a cheese board is a great option to serve along with crudite and dips. See post here for some dip recipes. My favorite cheeses are brie, camembert and parmesan. Actually, I love all cheeses except for blue cheese, I won’t go near that or any other cheese that looks moldy. 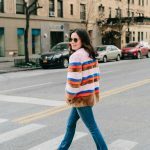 I decided to reach out to 3 food bloggers who I greatly admire, Kim Kushner of Kim Kushner Cuisine, Laurie Lloyd of Liv Light and Neda Varbanova of Healthy with Nedi, to get some expert advice on how to create the perfect cheese platter. 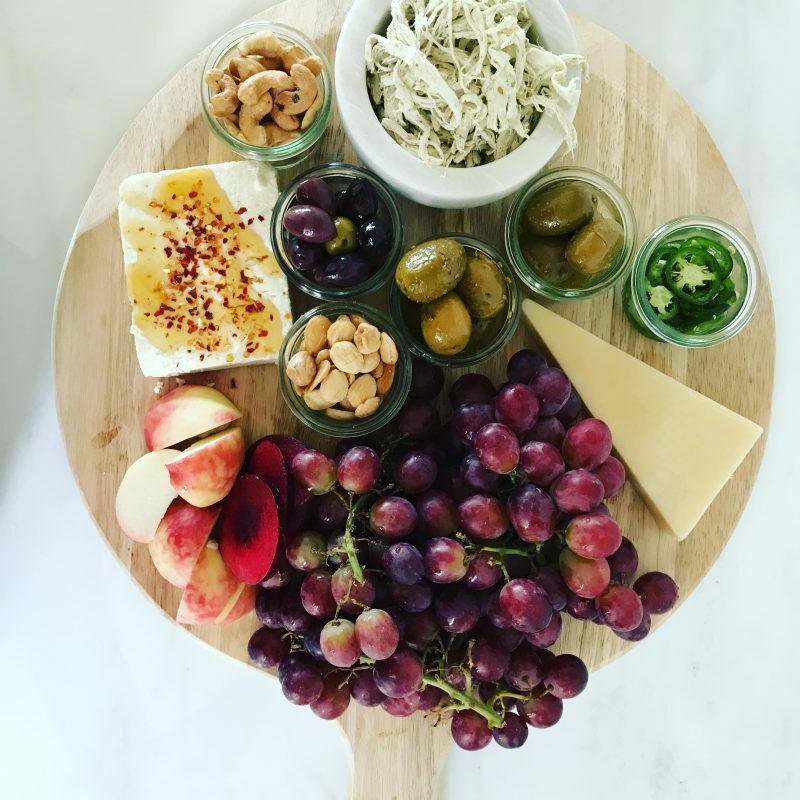 I was really excited by their responses and their suggestions and helpful tips inspired me to create my very first cheese platter. Here is my creation, quite an accomplishment I must say. It was great fun, a unique way to channel my creative side and I considered it an adult art project. There are so many mouthwatering accoutrements that I think I need to invest in a bigger platter. All three bloggers suggested combining, sweet, savory and salty sides, and the combination spoke to my taste buds. Of course the best pairing with cheese platters is some good wine, but that, I already knew. 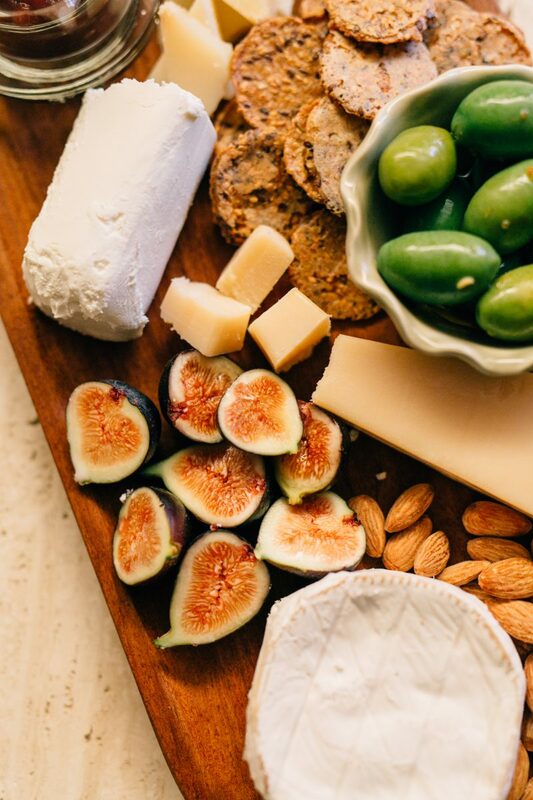 These 3 experts were kind enough to share their professional tips on how to create a mouth watering and visually appealing cheese platter. 1. What are your favorite cheeses to serve that make for a good assortment? KK: I like to mix hard and soft cheeses, mild and strong ones as well. I always have chunks of good Parmesan, a softened Camembert, and lately I love throwing in a block of Feta drizzled with truffle honey and sprinkled with chili flakes. LL: I always do a mix of flavors and textures and like to include cow, goat, sheep, and vegan cheeses to ensure there is something for everyone! I don’t personally eat diary, so I depend on the Whole Foods cheese department to help me choose those. As for vegan, I love the Kite Hill Ricotta and Soft Cheeses. NV: I love to have a selection of soft and hard cheeses. A nice sharp parmesan or manchego cut into chunks, creamy goat cheese, aged sharp cheddar, brie, herbed cottage cheese mixed with fresh spices and herbs, and Miyokos vegan cashew cheese are all incredible choices. Having an assortment of different color cheeses makes the platter look more fun and exciting. 2. What platters and cheese knives do you recommend? KK: It’s all a matter of personal style. I serve my cheese on round wooden boards because I love that rustic look and feel…but I’ve seen gorgeous cheese platters served on glass and even Fine China. I’m all about working with what you have – you don’t need to go out and buy something new specifically for your cheese plate. Be creative. I’ve used wooden wine crates turned over as a base for a cheese plate or just any ordinary dish covered with a piece of brown parchment paper for that woodsy look. My upcoming cookbook (book #3!!) is going to have an entire chapter dedicated to cheese boards and how to build beautiful boards for entertaining!!! LL: For platters, I always use a wood board…the bigger, the better. I also like it to be rustic like these two…see here and here. For knives, I like the Laguiole Spreader Set. NV: I either use a large wooden board, ceramic black so the cheese pops out, or a beautiful white marble platter with silver or gold lining. There are very nice and elegant serving knives that you can get to display for a dinner party. I love these two sets, see here and here. 3. What are your top 3 tips for arranging a cheese platter? KK: 1. Please use good quality cheese! That is by far the most important. If the cheese plate looks gorgeous but the cheese tastes like wood- there’s really no point. I am passionate about that. Also, please let your cheese come to room temperature before serving. I beg. 2. Accent your cheese plate with small jars of delicious jams, honey, mixed nuts, fruit, olive oil and olives. This adds dimension, color, and of course, choices! 3. Get inspired! Find photos of cheese platters that look amazing to you and try to replicate. It’s really easy and hard to mess up. Like I say with all food, if you start with great ingredients, it always turns out great. NV: First, always do a mix of fresh fruits, nuts and meats. By adding these three different food groups, the platter will look super colorful and provide more variety and increase the taste pairing better. Secondly, cut the cheeses in different shapes. Some should be thin and long slices, others cubed and others in chunks. Lastly, add decorative toothpicks on the side that can make it easier for everyone to grab a bite without getting too messy. 4. What do you decorate the cheese platter with? 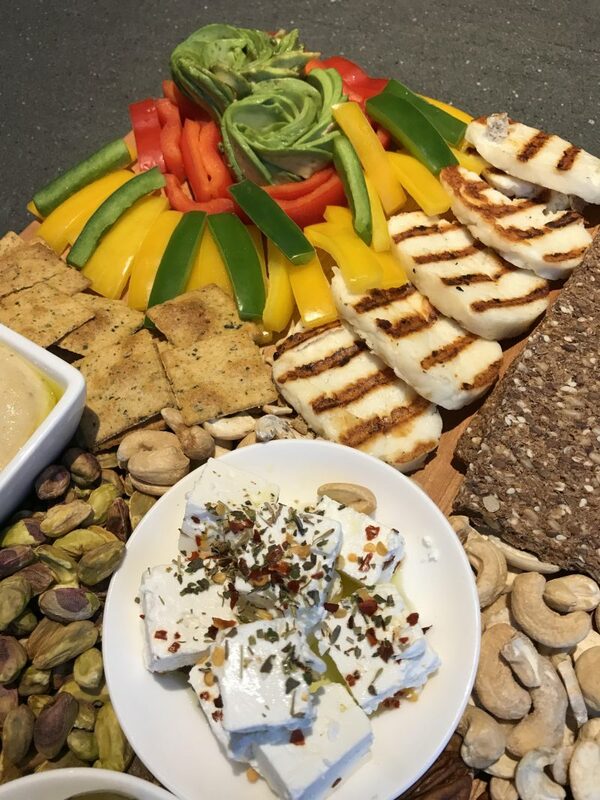 KK: I use glass mason jars of roasted nuts, Greek olive oil, fresh seasonal fruit (figs, pomegranate arils, berries, grapes), great quality dried fruits (medjool dates, plump golden raisins), fresh sliced baquette, gorgeous olives, sliced jalapenos. I LOVE throwing in my favorite dark chocolate broken into chunks…anything I have on hand, I always switch it up and have fun with it. LL: I shoot for a big variety of color…grapes, apricots, honey crisp apples, olives, etc. I always include both gluten free and wheat crackers…again, something for everyone. I also love to include nuts (Marcona almonds are a fave) and jams (pepper and fig). NV: Seriously, everything! I add dates, fresh figs, honey, almonds, walnuts, olives, gluten-free crackers, high-fiber crackers, and always prosciutto. 5. What do you typically serve along side a cheese platter? KK: Homemade hummus with crudités, lots of wine, perhaps a quiche. Or something sweet like a fresh fruit crostata. LL: I love a bright, beautiful crudité platter and caviar with all the accoutrements. NV: I usually serve a large platter of crudites, sliced cucumbers topped with roasted red pepper hummus, bean spread and muhammara. This way there is something for even the pickiest eater. 6. Being that you are health conscious, do low fat cheese platters exist? KK: NO. If you’re going to eat it, eat. Please. LL: I don’t believe in low-fat cheese. If I’m going to eat cheese, I eat the real thing. I love vegan nut cheeses, but they are not low-fat. I always include healthy crackers, fruit, and nuts for those who are tying to be more health conscious . NV: I am not a huge fan of low-fat products, especially when it comes to dairy. In general, too much dairy can cause inflammation so moderation here is key. 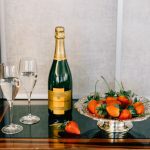 Make a beautiful cheese platter and serve other options such as fruits, crudites and crackers so there is a nice variety. When the fat is removed from a food, it is usually replaced with something else to make it taste good. So stick to high quality dairy that is either grass-fed or organic and add some nut cheeses to provide more healthy options. 7. If one is trying to be mindful of calorie intake, which cheeses do you recommend? LL: Cheese is not the best choice if you are watching your calories, but parmesan is the lowest in calories. NV: Parmesan cheese is one of the best options. It is low-calorie and it makes the perfect bite paired with a glass of wine.